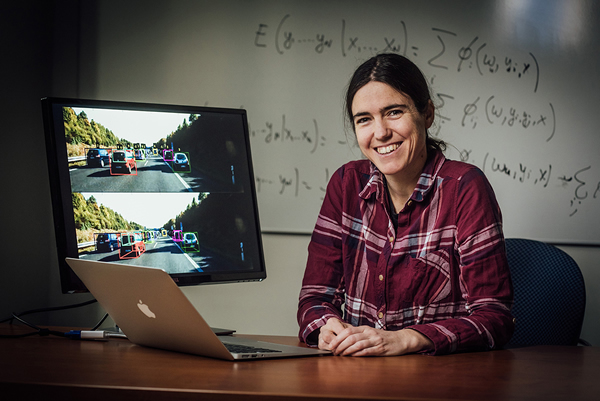 U of T Associate Professor Raquel Urtasun, who is a co-founder of the Vector Institute, is using her work with artificial intelligence to help develop self-driving cars (photo by Martin Lipman/NSERC). U of T Engineering has announced they are one of eight institutions from across North America selected to compete in the first-ever AutoDrive Challenge™, sponsored jointly by General Motors (GM) and the Society of Automotive Engineers (SAE) International. The intercollegiate competition tasks students with turning an electric vehicle, donated by General Motors, into a fully self-driving one. Approximately 100 students, including students from the Faculty of Arts & Science's Department of Computer Science will be needed to fill the various roles on the team, including calibrating the sensors, designing the software algorithms and testing to ensure safety compliance. The complete AutoDrive Challenge™ will last three years, and teams will meet each spring in annual competitions based around specific milestones. The first challenge, which involves driving autonomously down a straight road with no obstacles, is set to take place in the spring of 2018. Professor Tim Barfoot (UTIAS) has been working on visual navigation in robots for nearly two decades, and will serve as the team’s primary faculty advisor. Associate Professor in Computer Science Raquel Urtasun, known for her work in autonomous vehicles, will also lend support to the team as will other faculty in computer science and engineering. To find out more about the team and how to join, visit autodrive.utoronto.ca. Read more at U of T Engineering News.